Children from the Austin YMCA benefited from a great team building event sponsored by Centaur Technology, Inc. The event was a fun, fast-paced team building activity in which the participants from Centaur found themselves involved in several activities that ended with them building 14 bikes. At the end of the program 14 children from an area YMCA were brought in and received the brand new bikes as their very own. It was a great activity with a very touching close. At the beginning of the program the Centaur people were introduced to 9 people principles that are important to personal and team leadership, as well as building team cooperation. After the people principles were “pictured” and “caught” by the participants they broke into teams and displayed their various talents through the process of picking a team leader, coming up with a team name, creating a team flag and designing a team cheer that was presented to judges. After the cheer competition each team was given an envelope containing problems to solve, questions to answer, riddles to overcome. And as each was answered they received parts to build bicycles. This sounds much easier than it was for there were hidden problems and obstacles that surfaced along the way. 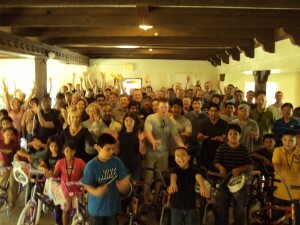 But in the end the bicycles were build, the YMCA kids very happy, and everyone had a great time with the experience. When a large group is split into teams it is only natural that competition comes into play. Throughout the event it was stressed that nothing was a competition, even the cheering was just an opportunity to display creativity and talent, not a competition. And when the bike building started, it was again stressed that it was not a competition, but rather a goal to build 14 bikes. But it still became a competition as teams raced to see who could get done first. But int he end it was the goal that was accomplished. The group had fun and donated 14 bikes to kids who needed them. When there was competition between the teams the whole process suffered, and momentum toward to goal was reduced. But when teams realized that to reach the goal all 14 teams had to help each other, each person had more enjoyment and the work was done faster. It was a great day, with great lessons and great fun.